VERY OLD VINES – 50 years old, MANY 75-100 years old ! LE PERREON SHOULD BE A CRU VILLAGE! NEW YORK'S NUMBER ONE BEAUJOLAIS YEAR AFTER YEAR ! Domaine de la Madone is one of our favorites--few estates craft such character-rich, expressive Gamay outside of Beaujolais' band of "cru" villages. But that's Madone's secret--their vineyards should be rated Beaujolais cru (or grand cru, if we had any say in it). This is certainly one of the finest values for the quality anywhere in the world. There are many terroir parallels between the village of Le Perréon and cru Fleurie, a village known for its aromatic and wonderfully elegant Gamay. 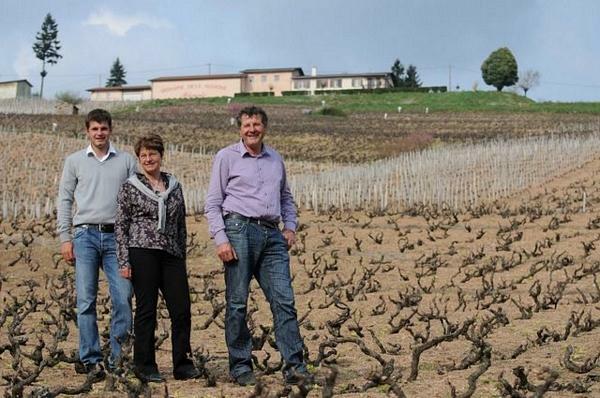 Brothers Olivier and Bruno Bererd tend almost exclusively older vines, many which are more than 100 years old. The family's steep hillside vineyards are a challenge to harvest (at an angle of 30 to 40 degrees! ); the brothers can't drive a tractor through their fields, as it's too dangerous--pickers have to scoot along at severe angles and struggle with a wheelbarrow as grapes are painstakingly collected at harvest. Our selection of Beaujolais Le Perreon from is vinified gently in tank, to preserve every bit of fresh, aromatic and juicy fruit. Wine Advocate 90 "The 2013 Beaujolais “Tradition” has an attractive nose of raspberry leaf and mulberry fruit that is well-defined and feels very natural. The palate is medium-bodied with crisp tannins, very pure fruit and great tension running through the strawberry and cranberry infused finish.